Calcium, potassium and vitamin D are nutrients of public health concern. Sounds scary, huh? That’s the designation these essential nutrients were given by the 2015 Dietary Guidelines Advisory Committee report because many Americans – including children – don’t get enough in their diets, and this widespread shortfall may pose health risks. After all, these three hardworking nutrients are important to our health. Not only do they keep our bones healthy and strong, potassium helps play a critical role in maintaining healthy blood pressure while muscles and nerves need vitamin D to function normally. Upping the ante for these three nutrients of concern is not difficult. All are found in dairy foods, like milk — which is an easy ingredient to add to recipes to get these nutrients. Pairing your meal with an 8-ounce glass of skim milk is another easy way to increase your intake of these nutrients without the fat. Swap out water for milk in your favorite oatmeal recipe — that’s an easy tweak to add nutrients. Another way you can power up your breakfast bowl? Overnight oats. 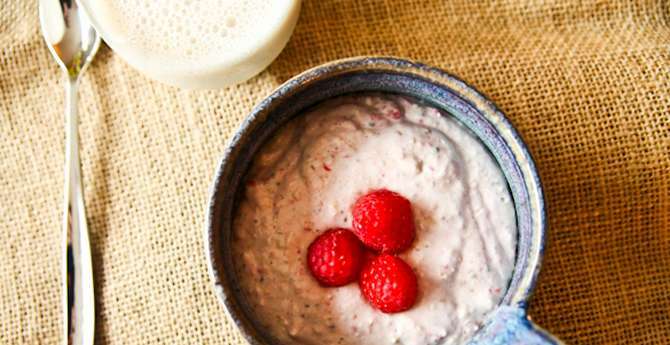 Simply combine equal parts raw, rolled oats and milk in a covered bowl or mason jar and stash it in your refrigerator overnight. No cooking is involved. In the morning, stir it up and top your favorite toppings like sliced fruit, nuts or a pinch of cinnamon. If you drink coffee with a splash of cream, switch to a latte made with skim milk. Why have salad for lunch when you can have a power bowl? Instead of salad greens topped with croutons and dressing, swap your plate for a colorful power bowl. 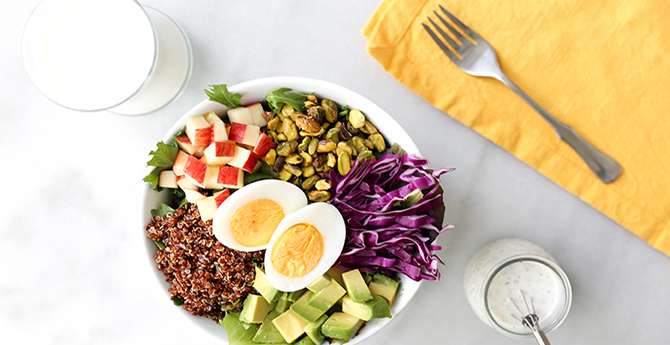 This hearty bowl, with toppings like quinoa, hard-boiled eggs and avocado, is a new take on your midday meal. Switch up your regular iced tea and enjoy with an 8-ounce glass of milk with 8 grams of high-quality protein. Recipe and photo by Elle Penner of According to Elle. When short on time in the evenings, spaghetti with marinara sauce is a quick meal everyone loves. However, there is a way to power up your pasta to add more nutrients in every bowl. 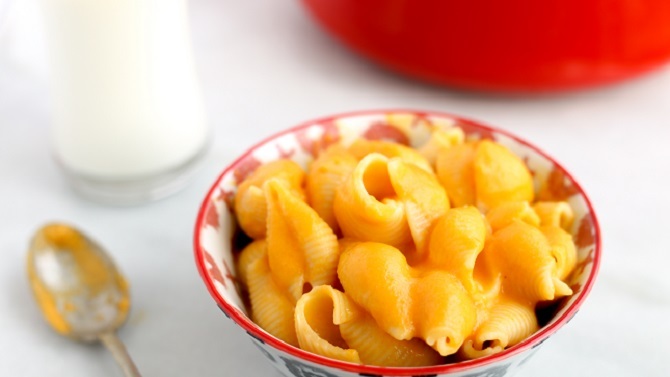 With just a few more steps to get dinner on the table, this twist on a classic favorite mixes butternut squash with shells and cheese for a new family favorite. Pair it with an 8-ounce glass of skim milk for a more balanced meal.